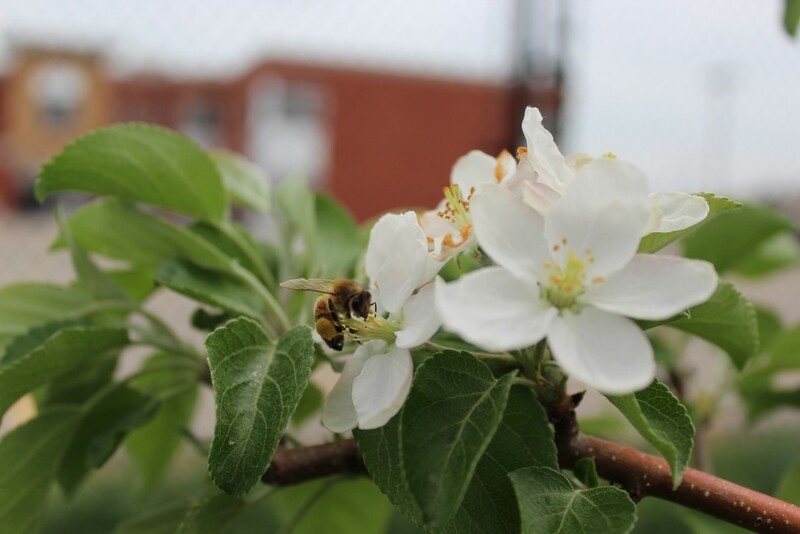 There has been a lot of conversation in recent years about pollinators. Their importance in our eco- and food-systems cannot be understated. Here at Pfenning’s we love bees! Wolfgang Pfenning is often called the bee-whisperer, and he truly is happiest interacting with his hives. Many of our farms have hives hidden in their far corners, or on the tops of hills. Some of them are Wolfgang’s, and some of them belong to Nith Valley Apiaries. 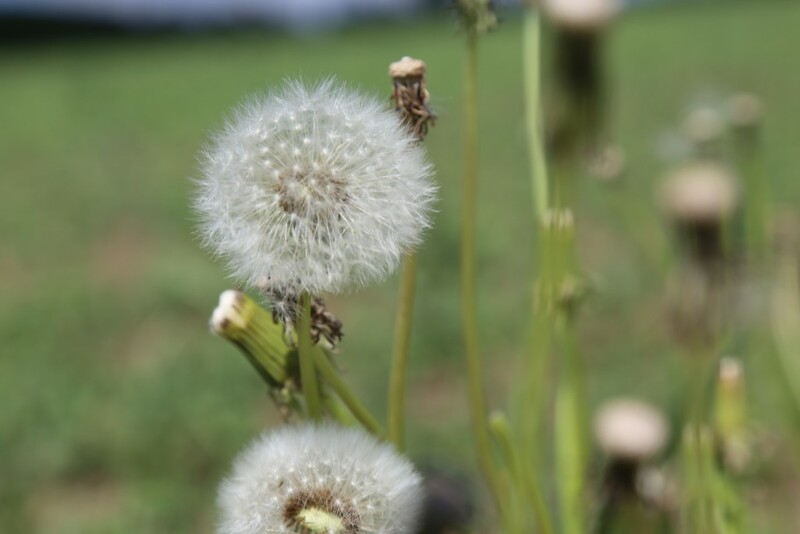 Did you know – Dandelions are some of the first food available to pollinators early in the spring season, a very important food source after a long winter! 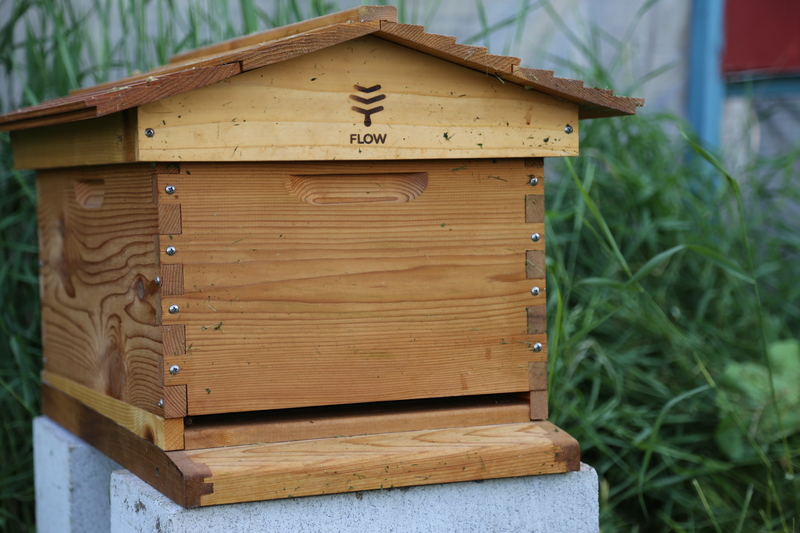 Ekk Pfenning recently received a new Flow Hive, which is a revolutionary new bee-hive design that safely allows you to harvest the honey without disrupting the hive. 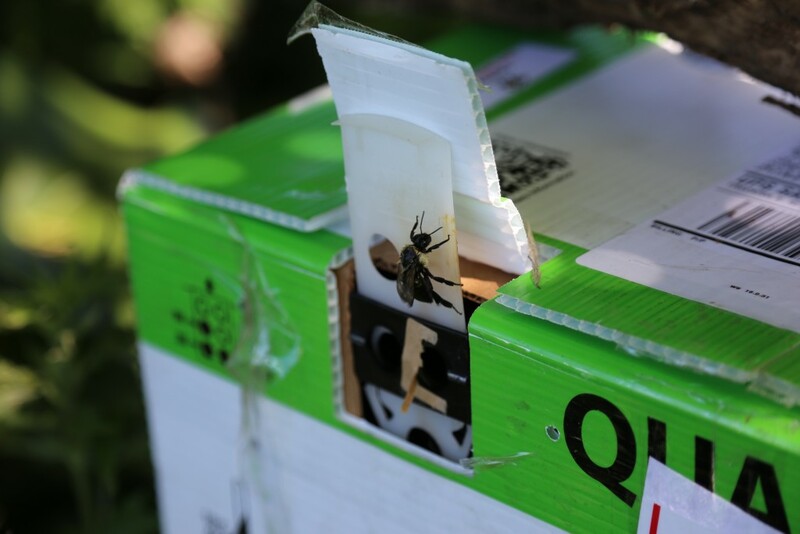 One of Wolfgang’s hives produced another queen, meaning the hive could be split, which he did by putting the queen into the new Flow Hive. Wolfgang very carefully places a comb into the Flow Hive box. 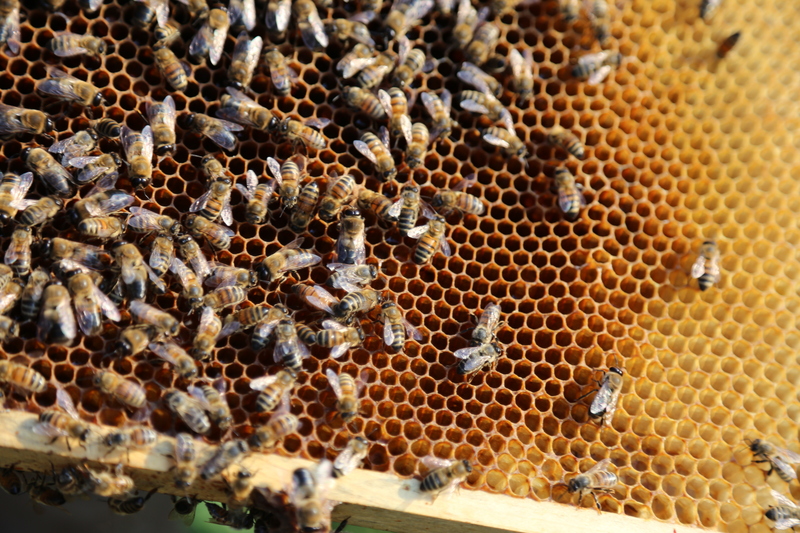 Honey bees are often the species we think of when we talk about pollinators. While they certainly are the most famous, as can be seen from Honey Nut Cheerios’ #BringBackTheBees campaign, they are only part of the overwhelming amount of creatures that work at the task of pollinating – other bee species, wasps, ants, flies, butterflies, moths, beetles, birds, bats, even lizards and snakes are known to help pollinate some plants in their habitats. At the Ontario Fruit and Vegetables Convention in February, I spoke with representatives from Koppert Canada. 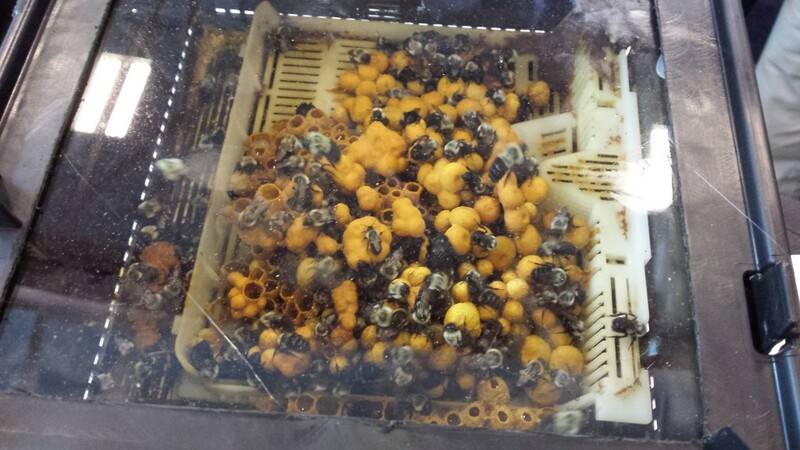 I was fascinated by their display of a bumblebee hive. They sell these units to growers as a pollination service. You can imagine my surprise to learn I won their draw to receive my very own QUAD outdoor pollination station! We put it on one of the farms, underneath a large tree. At the convention I also went to Susan Chan’s presentation “Conserving Pollinators and their Habitat on the Farm.” Susan works as Native Pollinators On-Farms Program Manager at Farms At Work and I learned a lot from her presentation. Did you know – 70% of solitary bees are ground nesters and the other 30% are cavity nesters! This means that tillage practices and removal of hollow stemmed brush not only removes habitat but can also kill the next generation. 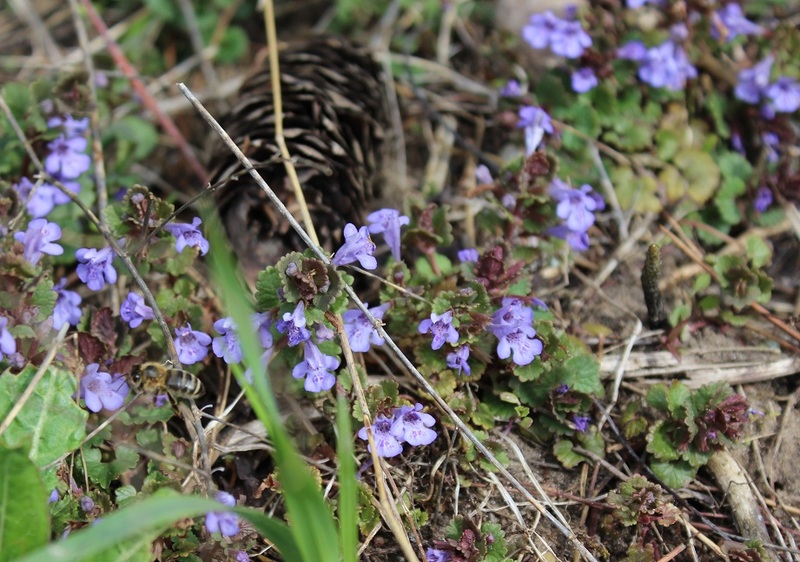 Even tiny flowers close to the ground offer food, and undisturbed land gives nesting habitat for ground dwellers. 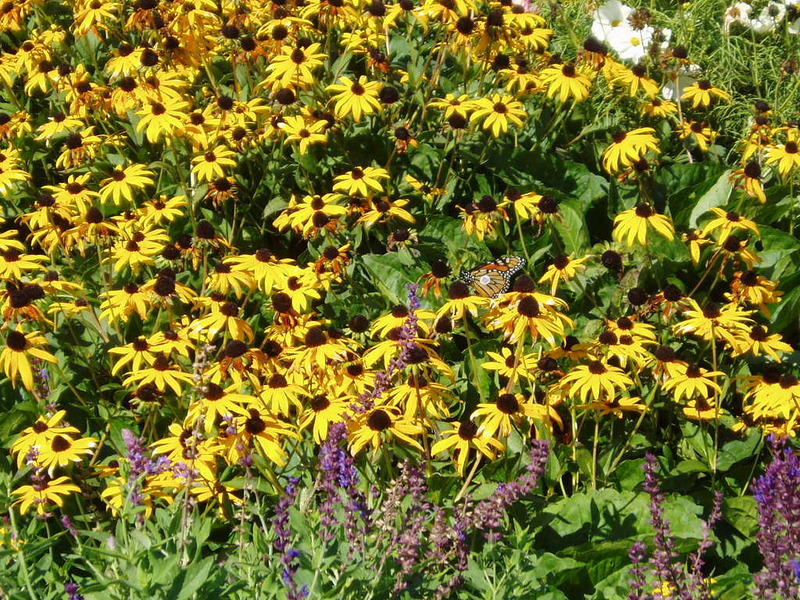 Can you spot the pollinator in this picture? 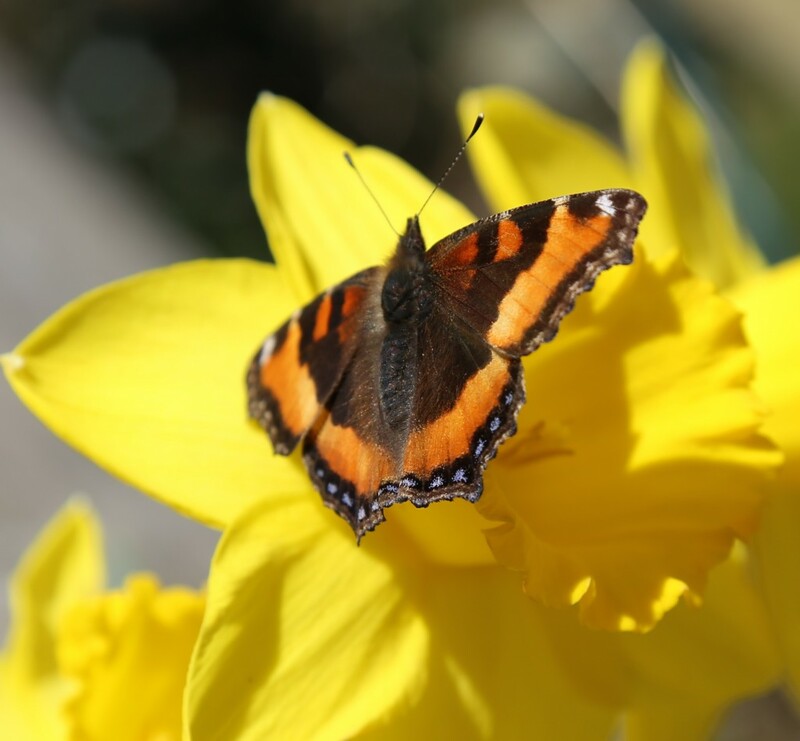 Farms with good pollinator habitat can benefit by having higher yield of insect-pollinated crops. 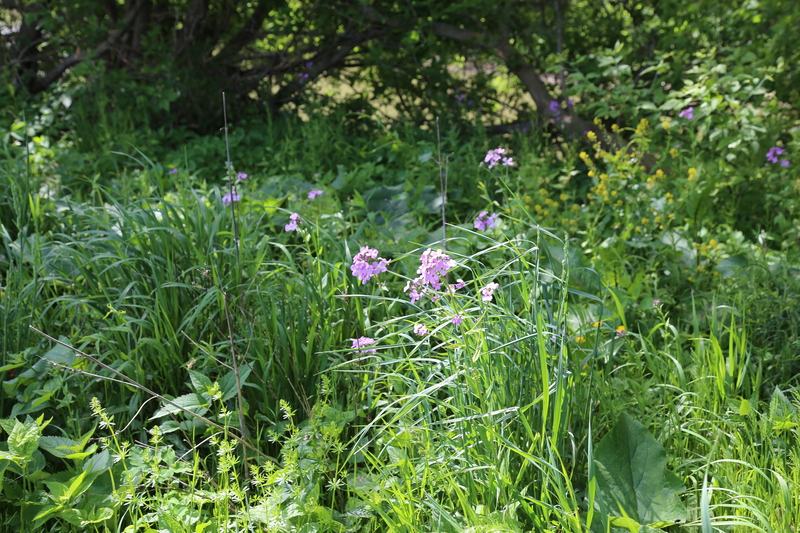 This habitat also encourages other beneficial species that can improve pest control. For example, our friends at Lakeside Organic Gardens in Watsonville, California inter-crop Alyssum plants to encourage beneficial organisms that serve as a pest-control measure, while also providing food and habitat for other pollinators. This year we are giving this approach a try to help out our Trichogramma wasps, a beneficial insect we use to control pests that damage our Brassica crops. 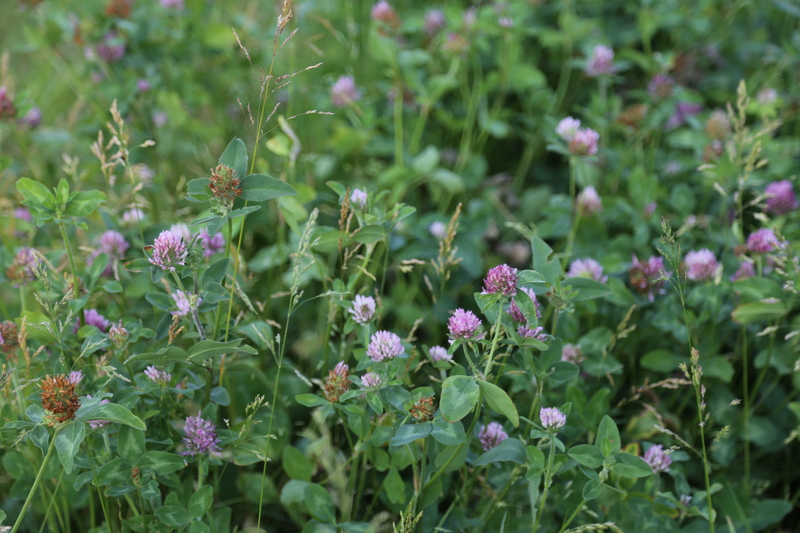 Creating pollinator habitat on farms can also provide other land stewardship goals. Plants help control soil erosion and build soil organic matter. 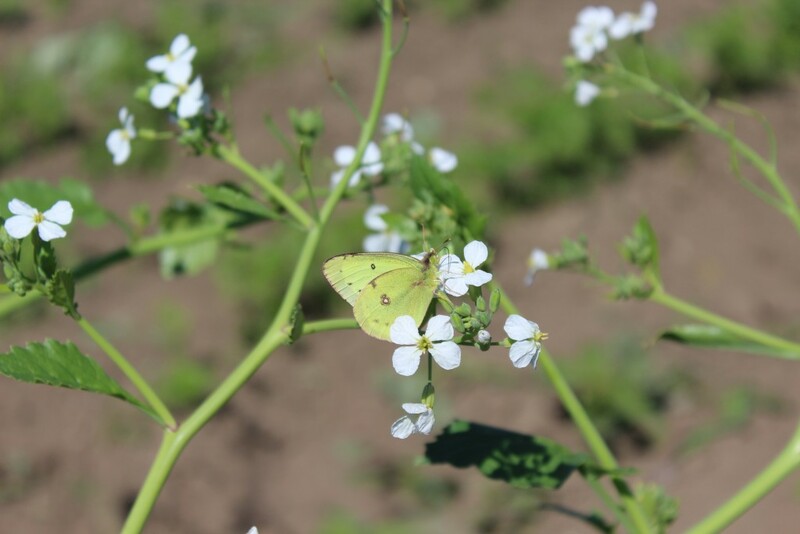 Many cover crops are delicious food for pollinators and cover crops can add nitrogen and organic matter to soil. Funding can be available to land-owners who wish to incorporate more pollinator habitat on their lands (GLASI, SARFIP). Taking a holistic approach to agriculture puts into perspective the need to be responsible with our resources and not take our environment for granted. We need to promote the habitat that best supports our pollinators!